Traffic Lights: Solution or Problem? Posted May 17th, 2012 by Karl & filed under Social. Traffic Lights. Are they a burden on road users? Today I read an article on the BBC News website by Martin Cassini of whom stated that traffic lights are or have become more of a hinderance to traffic safety rather than being a beacon of order and protection. An interesting article, no doubt. It certainly got me thinking about a potential problem we may have on the roads that I was unaware of before reading the post. However, I couldn’t help feel the article was in some way incongruent. I’d like to point out that despite the probable tone of the article I’m not necessarily opposed to the idea. Also, my point to this article is to unravel assumptions and poorly marked arguments, rather than argue for or against traffic light systems as a whole. Throughout the article the underlying premise is that traffic lights do not help prevent accidents in the way that people would intuitively expect them to. He states many ideas and some examples from studies to illustrate his point. His argument is that if we were to do away with traffic lights and let people use ‘common sense’, traffic would be more streamlined and possible accidents would be reduced. Mmm. One estimate puts the annual cost of accidents at between £15bn and £32bn and in my view most accidents are not accidents. They are events contrived by the rules and design of the road. As a driver, when you see a green light, are you watching the road? You’re probably watching the light. You’re probably right, I probably am probably watching the light and not the road; but this is a flaw in the design of the traffic lights and not with the thesis of a traffic light system as a whole. It certainly doesn’t mean that not having traffic lights is better and that the idea of a traffic light like system is flawed. Ah, a piece of evidence taken out of context in order to add weight to a point. 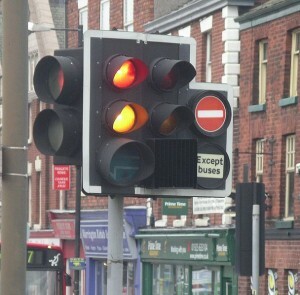 Traffic lights are typically placed in areas that are generally dangerous because they have turns or junctions that will inevitably lead drivers to cross paths. I would imagine that most of these accidents then are the product of simply careless driving and not of the traffic lights themselves. I think I can say with confidence that not all of those accidents are directly due to traffic lights. Reminds me when I went to Spain. Didn't feel overly confident crossing that road. Instinctively, we want to be kind to each other, especially out on the road. We do? A bit of a dangerous assumption to make for the case of removing traffic lights, I feel. Main road priority licenses main road traffic to plough on regardless of who was there first, including side road traffic and people on foot waiting to cross. If you’re driving along a main road do you even notice that mother with a pram on a traffic island trying to cross the road? You might notice her but you can’t really stop and let her go if there’s a 10-tonne truck on your tail, especially if there’s a green light ahead. Even though this is probably a (fair) critique of main road priority, it feels like the green light reference was just thrown in alongside the mother with the pram to ignite your emotional response against the traffic light system. If you’ve got a 10-tonne truck on your trial and there’s a mother with a pram crossing the road (which could happen anywhere if we have no traffic control systems) then you’re still going to have the same problem here. I think potentially though Exhibit D is more of a bad example than anything else. Or, we just drive straight on through and cause an accident. For the potential accidents that removing traffic lights could reduce, others may and probably will emerge. Martin Cassini then goes onto say you can’t legislate for maniacs like in my point above and, he’s partly right. The same maniac in my example probably would do the same thing with traffic lights in place. However, I don’t think it’s as clear cut as simply “all maniacs would do the same in each situation and thus removing traffic lights would simply remove all the accidents caused by traffic lights”. Martin then goes onto talk about the heart of the issue, being ‘priority’. He believes that priority causes people to rush because they need to beat the artificial inseminations that are traffic lights et al, as they only cause undue waiting at best. However on the other side a lack of priority anywhere would cause people to assimilate their own priorities which would have in itself once again its own issues and faults. For example, imagine a crossroads with no traffic lights. People can come and go as they please. However, there is undue amount of traffic here to the point where it’s always very, very busy. With no traffic lights in place you would instead have to assume (with common sense) when it’s your turn to go. However what if you have to wait several minutes or more before you can move? I can quite easily see this causing people to make rash decisions and thus cause accidents. 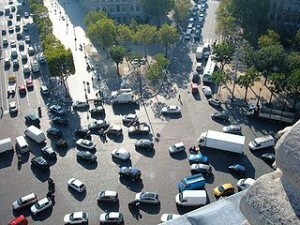 I think though – despite my claims to the contrary – there probably is a need for a shake up with the way traffic works. There’s no perfect system, I think history would show this in any aspect where you look that everything has its faults. I do not think that traffic lights and the priority system are a pure evil, however as is almost always the case and as systems like this linger on over time, their inevitable pros and cons start to emerge. For me, traffic lights help make me feel comfortable and confident when driving (which I generally don’t). If these rules were taken out, I would go out onto the road which a great deal more fear, which would produce its own problems but I think that is half the point of Martin’s argument. Fear would force people to drive more safely. I think it’s clear why that argument isn’t solid and probably why Martin’s pleas for a traffic lightless system still hasn’t been introduced even though he was talking about this 6 years ago.